GRAPES OF WRATH, by John Steinbeck (1939): The book that gave us the “Mother Road” moniker for Route 66. While many folks have read this literary classic back in school, it is definitely worth a re-read if you are planning on driving Route 66. Set during the Great Depression, this story of sharecroppers, driven from their Oklahoma home by drought, economic hardship, and changes in the agriculture industry, puts the early years of Route 66 in perspective, reminding us that the road did not always symbolize the free-wheelin’ spirit of adventure that we have today. In those early years, many of the route’s travelers were fleeing a nearly hopeless situation, and only took to the road in search of land, jobs and dignity in the mythical promised land of California. ON THE ROAD, by Jack Kerouac (1951): The original road trip book. Based on the spontaneous road trips of Kerouac and his friends across mid-century America, “On the Road” is, in a sense, the inspiration for every modern American road trip — the book embodies the spirit of freedom and the road. Typed out as one long, single-spaced paragraph on eight long sheets of tracing paper that Kerouac taped together to form a 120-foot scroll, it is considered a defining work of the postwar Beat Generation, inspired by jazz, poetry, and drug experiences. THE AMERICANS, by Robert Frank (1958): A poignant visual record of America in the 1950s, made over a series of road trips across the country. Frank captured the hopes and fears of ordinary America, in images so strong they continue to touch us more than a half-century later. “The Americans” can be considered a visual counterpart to “On the Road,” and in fact, Kerouac wrote the introduction to Frank’s book, which has become a classic of modern photography. Focused on the inland American West during the last half of the 19th century, this book gives the uninitiated a broad overview understanding of the historical events that defined the popular image of the “West.” It shows how the railroads opened up the area to settlers, leading to the conflicts with the Plains Indians already living there. And continues to detail how the Indians made their final stand as cattle ranches spread from Texas to Montana. It also examines the origins of the Western myth in literature and traces the rise of rodeos and Wild West shows. An easy read, “The American West” gives readers a familiarity with some of the main characters of the Western narrative: Geronimo, Crazy Horse, Sitting Bull, Wyatt Earp, Buffalo Bill, Charles Goodnight, Billy the Kid, Teddy Roosevelt, Generals Crook and Custer. 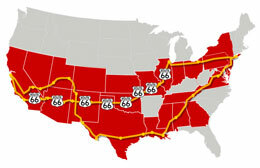 Click on the map to view images from the Great American Road Trip by State. The Great American Road Trip 2010 is dedicated to the memory of our "Renard Rouge."